This web page took sevaral hours to scan, research, design, and upload. Thank you for supporting the Virtual Steam Car Museum! 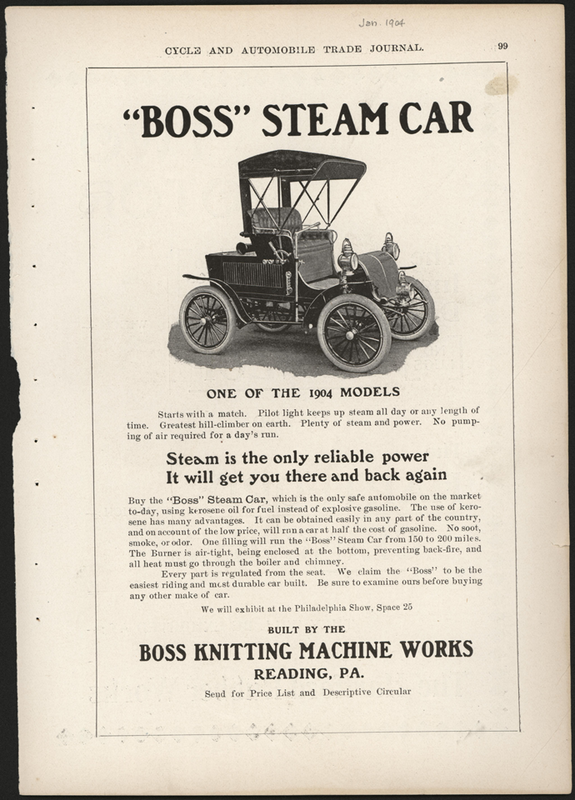 The Boss Steam Car was sometimes referred to as The Eck after its designer, James L. Eck. The car had a 2-cylinder 7/8 hp engine, and was tiller steered. It weighted 1,400 lbs and had a separate unsprung underframe for the running-gear. The price was $1,000. 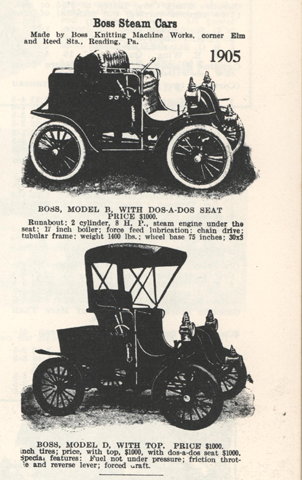 On January 1, 1904, Boss placed this full page advertisement in Cycle and Automobile Trade Journal, p. 99. 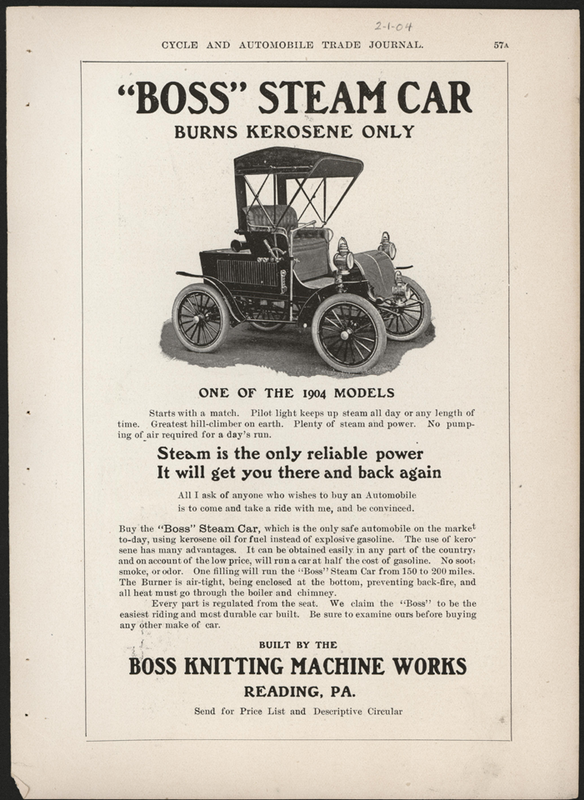 It is the earliest Boss advertisement in the VSCM Collection. John A. Conde Collection. 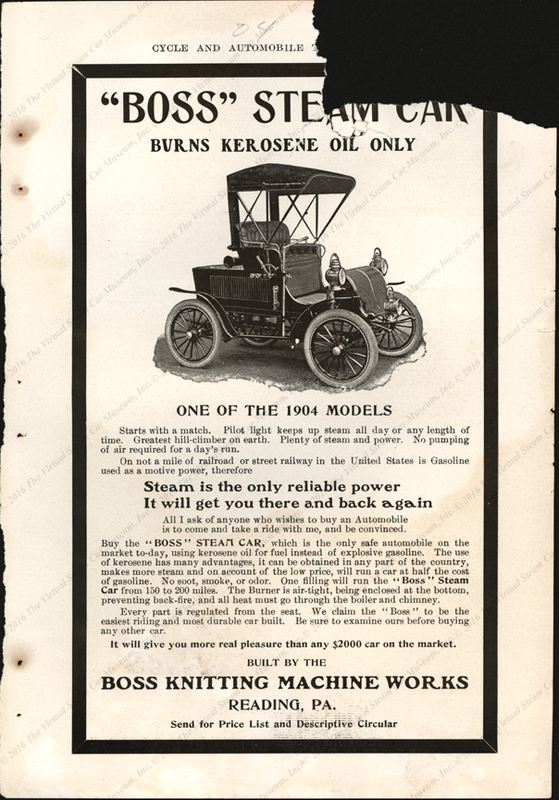 On February 1, 1904, Boss placed this full page advertisement in Cycle and Automobile Trade Journal, p. 57a. 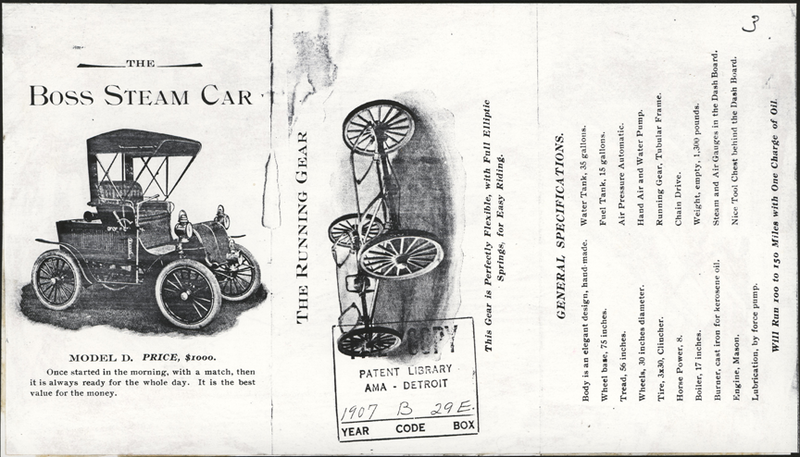 On the reverse was an article about the Twombly Motor Carriage Company. John A. Conde Collection. This 1904 advertisement appeared int eh Cycle and Automobile Trade Journal. 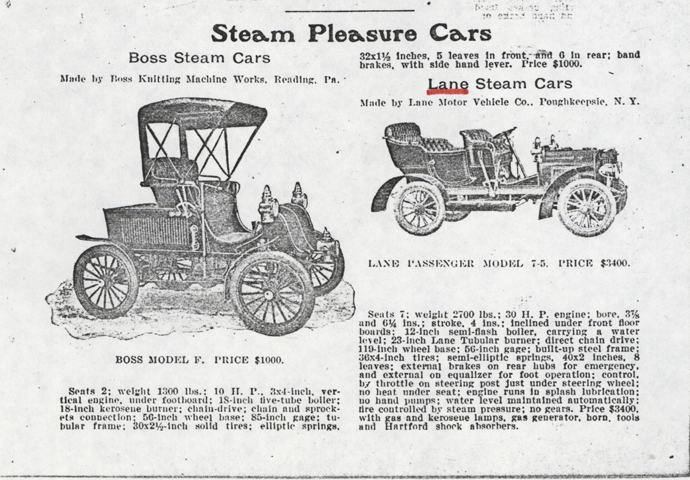 The text above is found on page 208 of The Automobile of February 13, 1904. Photocopy. 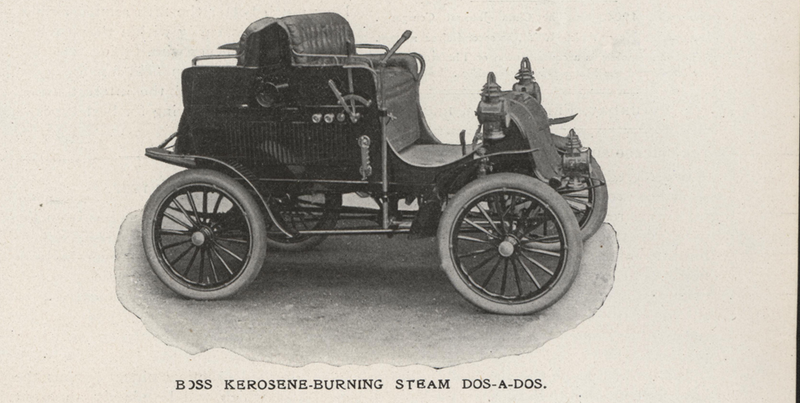 Page 209 contained an illustration (below) of the Boss Steam Carriage. John A. Conde Collection. 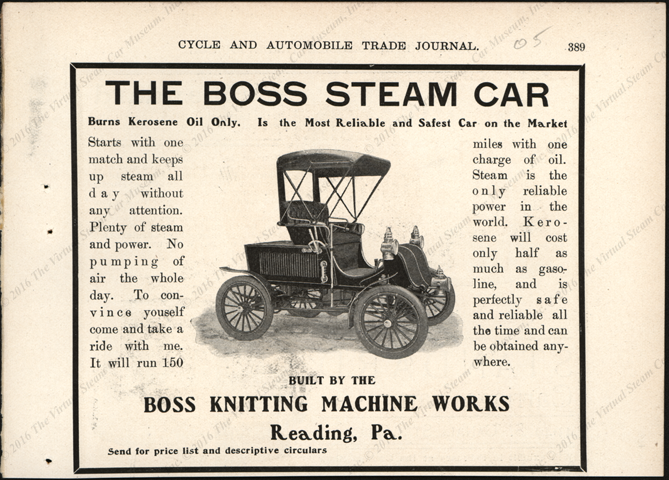 The Boss Knitting Machine Works placed this advertisement in a 1904 issue of Cycle and Automobile Trade Journal. 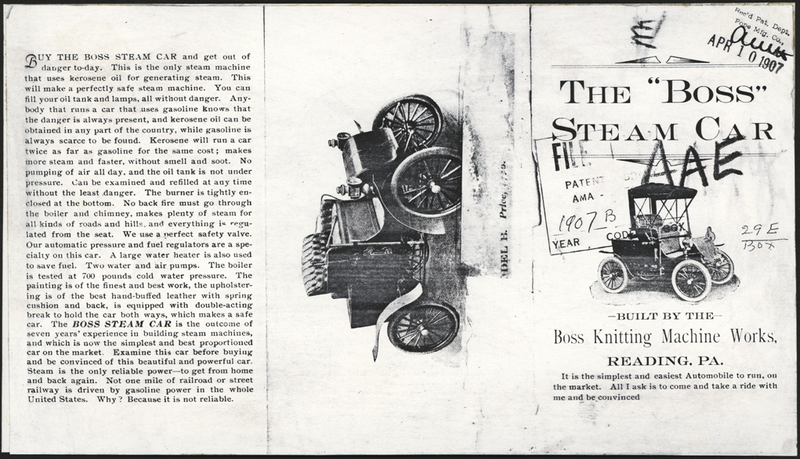 Conde copied this page from Floyd Clymer's Steam Car Scrapbook, p. 65. Photocopy. John A. Conde Collection. 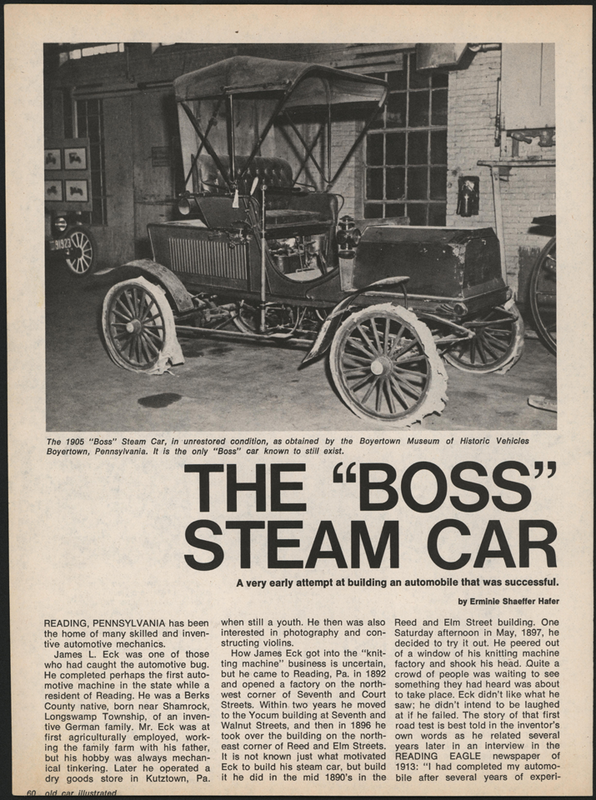 The Boss Steam Car was featured along with other steam car manufacturers in this page from a 1906 issue of Cycle and Automobile Trade Journal page 158. Other steam cars include Clark, Ross, Chicago, and Johnson Service Company. 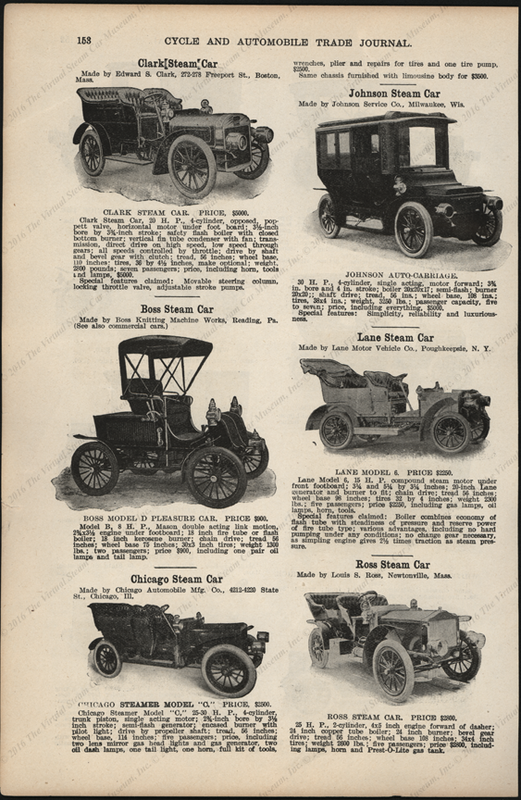 This trade catalogue came to the Automobile Manufacturers Association on April 10, 1907. The text claims the car is the work of seven years. Photocopy. John A. Conde Collection. 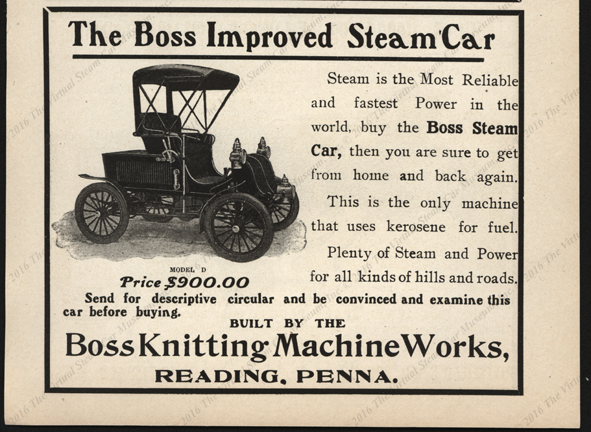 The Boss Knitting Machine works placed this advertisement in a 1905 issue of The cycle and automobile trael Journal, page 389. This four page article by Erminie Shaeffer Hafter appeared in Old Car Illustrated pages 60 - 63, Vol. 4, No. 5, Septembrer, 1978. 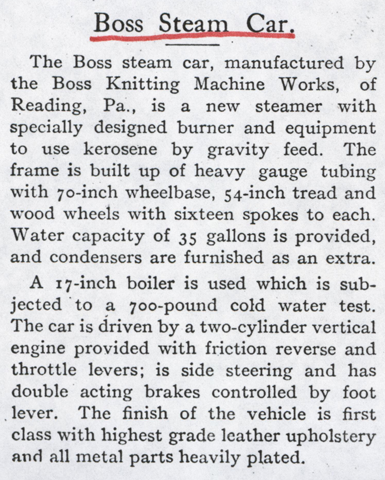 This article appeared in the "Steam Pleasure Cars" section of the March 1907 edition of Cycle and Automobile Trade Journal, p. 226. Photocopy. It shared the page with the Lane Motor Vehicle Company. John A. Conde Collection. Georgano, G. N., Encyclopedia of American Automobile, (New York, E. P. Dutton & Co., 1968), p. 29. Thanks to Wayne Hulsey's email for the magazine dates. Contact us if you have additional information about the Boss Knitting Machine Works, or if you have questions.